Crunchy, puffy pretzels with caramel - quick to make and yummy! Of course October is THE time for all kind of pretzel, pretzels: the big lye soft pretzel together with your weisswurst (Bavarian sausage) or the small salted pretzels – we were in the mood for small sweet pretzel without salt. Yes, I know caramel without salt, fleur de sel, sea sold – how old-fashioned and European is that. Well give it a try and if you like to do so you can still add some salt. With these sweet pretzel dish you have a great token for your own little Oktoberfest or a snack at the end of your five-course Bavarian dinner. These soft caramel pretzels are perfect together with ice cream and make a nice dessert. 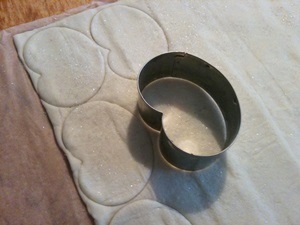 The preparations are rather easy you need a pretzel cutter, puff pastry and caramels or toffee. First you have to crush the caramel candy. Crushing candy a meat tenderizers comes handy (any kind of hammer will do). Fill your candy in a plastic bag and start hammering. 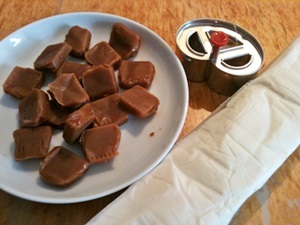 We used soft chewy caramels and used a rolling pin or the broad plastic end of a knife. The soft toffees can be cut in small pieces. Roll out the still cold puff pastry. Sprinkle caster sugar evenly on top of the dough. Now you can cut out the pretzel bottoms and pretzel tops. To make sure to have enough tops and bottoms either cut them out alternatively. It is more convenient to start with the pretzel bottom. 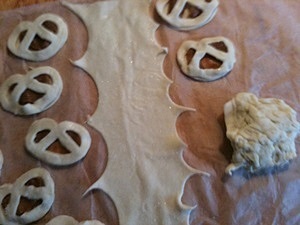 So I flapped the puff pastry rectangle to see were the middle would be and started doing the pretzel bottoms. When I came close to the middle I cut out the pretzel tops. Caramels on the bottom of the pretzles, cut out pretzels on top, that is how easy you can fill your caramel pretzels. Put the crushed caramels on the bottom of the pretzel – with the heat of the oven these will melt. So if you cover them unevenly, this won't matter very much. If you use to much caramel the hot caramel will spill over and you will get caramel brittle. Cover the pretzel bottoms with the pretzel tops. In the meantime: preheat the oven to 160 degrees Celsius. Take the remaining puff pastry and roll it out again. This puff pastry will behave slightly different when bakes as there is caster sugar in it. I made a rectangle placed chocolate and nuts on one side and pulled the other side over. I cut out triangles. Maybe there are members in your family who don't like caramel. 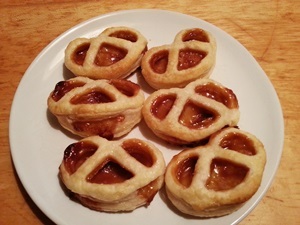 Now you can offer them sweet puff pastry with and without caramel. Bake the caramel pretzels for 12-14 Min. The caramel will melt the puff pastry will turn golden on top. Pull the pretzles gently out of the oven, let them cool – and enjoy!